When we think about planets we always assume they are Earth-like, or like the other planets in our solar system such as Mars or Jupiter. Most of the Exoplanets discovered so far have been similar to Earth, or have had water. Of course, if the planet is Earth-like, there is an anticipation of life. However, there are many exoplanets with environments that are extremely different and interesting. 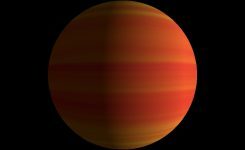 KELT 9b is currently in the news for being an extremely hot planet as compared with its host star. In the Cygnus constellation, about 650 light years from Earth, it orbits around the A-type star KELT 9 once every 1.48 days. 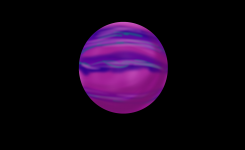 It is considered a gas giant and it’s mass and radius are 2.9 times and 1.9 times that of Jupiter, respectively. The temperature of the star is about 10,000 degrees (our sun is about 6000), and the planet revolves at about 1.3 AU (about 1 tenth the distance of Mercury). Due to this, the surface of the planet is expected to have a fairly high temperature. 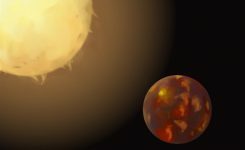 When a planet hides around the back side of the star, investigating it is difficult, so when Kelt 9b’s temperature observation was 4600k, a new temperature environment had to be understood. That is over 7 times as hot as any solar system in the milky way galaxy, including our sun, and as hot as an M-type star, whose surface temperature can reach 4000 degrees. 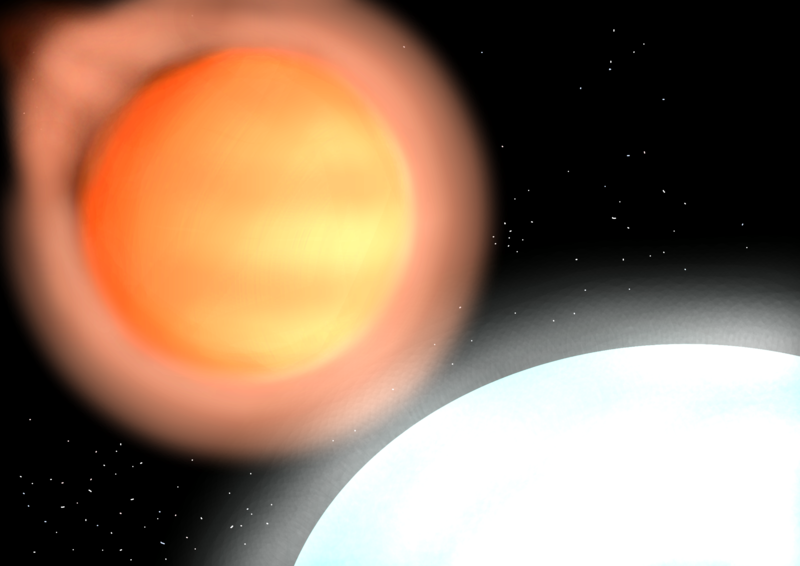 In other words, KELT 9b has a hotter atmosphere than many stars. When it comes to these temperatures, water, oxygen, and carbon dioxide, (the usually well-acquainted molecules in a planet’s atmosphere), cannot survive. Due to this, it is thought that the planet’s atmosphere is made of of mostly atoms. 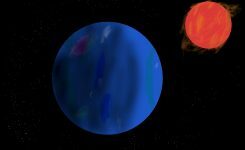 So far, this planet is completely different than those that have a molecular atmosphere, and because it differs from a star’s atmosphere that holds heat, it is a completely unknown atmosphere. On top of that, the radiation from the host stars extreme ultra-violet rays is very strong (wavelengths less than 91.2nm have extremely high electromagnetic waves), so the planet’s atmosphere is expected to be continuously dispelled by the high temperatures. With this amount, it is expected to expel 1 ton or more of its atmosphere every second, and might look like the tail of a comet. Another interesting point about this KELT 9b is that its orbital axis is tilted 90 degrees towards the host star, which is called a polar orbit. When a host star and planet are born, they have a normal axis and revolution. 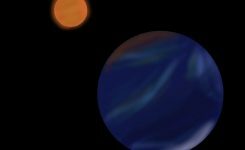 However, due to another planet’s gravitational interaction, an orbital change can occur. In the future, the Hubble Space Telescope and the planned launch of the James Webb Space Telescope will help us further determine the atmospheric discharge, and the atmospheric composition of KELT 9b. 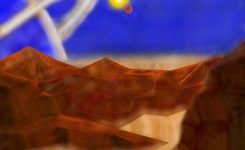 Until then, investigation is difficult, and this planet orbiting a very hot star gives us the possibility of new knowledge. 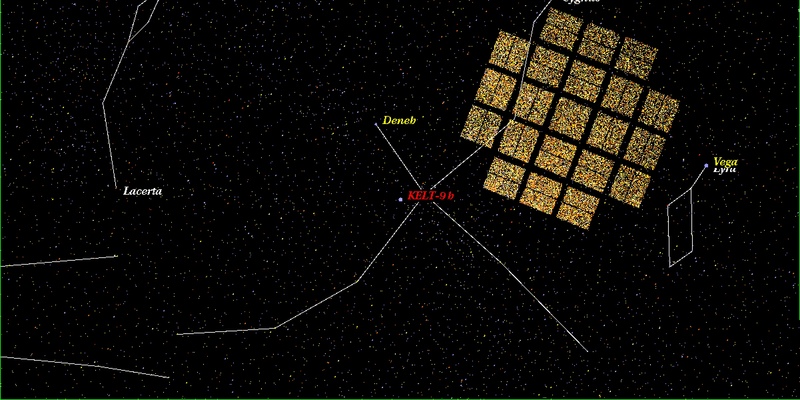 KELT-9b was discovered by the KELT survey, a program of planetary exploration that uses the transit method to target extremely bright stars,using a small telescope to investigate. Japanese scientists Dr. Norio Narita and Dr. Akihiko Fukui participated in the discovery.